Is your Popular Pin actually driving Traffic to your Blog? I designed a fantastic graphic (well I thought so) not so long ago. It was an info graphic on How to drink more water. I was super excited when it was shared thousands of times within a couple of days. Then I looked at my analytics. This oh so popular image had generated very few actual ‘clicks’ and traffic to my blog. This was really disheartening. It took me a bit of time, but I finally figured out how to change it. The reason my Pin wasn’t getting any clicks was that I had given all the information away on the graphic. There was no reason to actually visit the post to find out more. So I made another Pin for the same post (see the image below showing both pins). This time. I got clicks! Pin #1 is a lot better and it’s still being pinned like crazy, but Pin #2 is still doing it’s job driving traffic to my blog. In fact, it’s now one of the most successful posts on my blog. It’s not enough that Readers Pin your Image. As Bloggers, we need Clicks not just Pins. It’s those clicks that keep the traffic climbing. 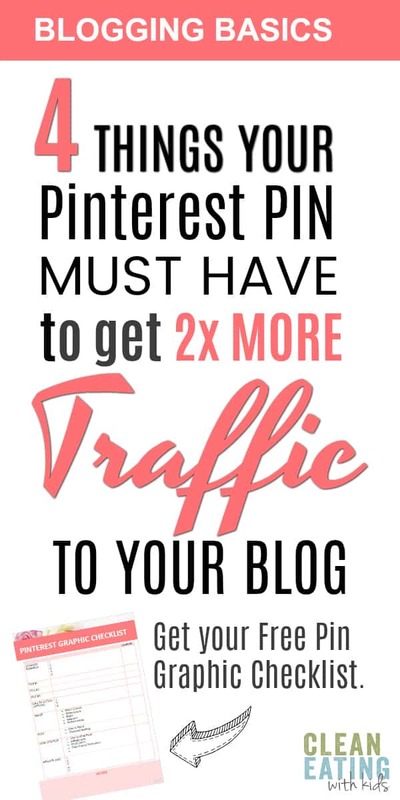 If you want to dramatically increase the traffic coming from Pinterest then it’s time to begin creating CLICK WORTHY PINS! GET YOUR FREE PINTEREST GRAPHIC CHECKLIST! Download your FREE Pinterest Graphic Checklist and Boost your Traffic from Pinterest Overnight! Success! Now check your email to download the Free Pinterest Graphic Checklist. How do You make a Click Worthy Pin? 1. SOLUTION: Your Pin should hint at providing an answer to a burning question, desire or a fear that your audience has. 2. URGENCY: Your Pin should create a need for urgency. The person looking at your Pin should want to know that information right now! 3. CURIOSITY: Your Pin should make the reader curious enough to want to find out more. There are FOUR elements we need to master when creating our Perfectly Clickable Pin. That’s it. I have not found there to be a difference in the conversion rates of longer vs shorter pins, despite what others have said, but let me know if you get a different result. 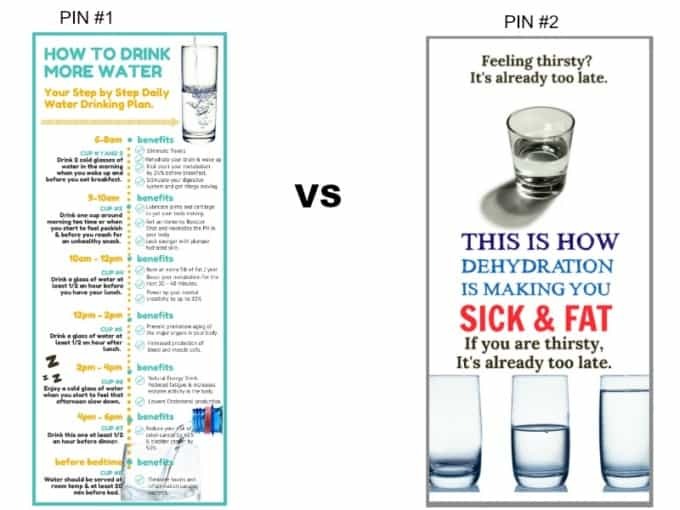 If you are creating info graphics, then you may need to use a longer Pin to get the information in, but it could end up getting trimmed in the Pinterest feed. These are the actual words on the Pin Image and generally the title of your Pin too. In a clear, easy to read font. Don’t over analyse your font design. Choose two clear font types and stick with them. I can’t even tell you how many hours I wasted trying to decide on the ‘perfect font’. Honesty, it doesn’t matter. And your Headline should include Keywords. These are the words a Pinterest user would type into Pinterest to find your Pin. I have a lot of Recipes on my website. Recipe Posts are generally all about the image not the headline. I get a lot of shares when it comes to Recipe Posts, but not as many Click throughs as I do when I create a compilation , mash up or write an article. The Recipe that gets the most amount of Clicks is my “Two Ingredient Clean Eating Pizza Dough”. Readers really want to know what those two ingredients are. Even though it’s a recipe, it’s the headline that converts. The image needs to suit the type of Pin you are making. It should enhance, not distract from, the Title. Make sure that your image is relevant. Search for Pins using the same keyword you want your pin to be found for and see what grabs your attention. You can assume that if a Pin is featuring in your feed it’s because Pinterest has deemed it to be a popular Pin in that search. Find a similar kind of image to use in one of your Pins and test the response. Here are 5 places you can get good quality images for your post free. White space is great, as it draws attention to your Headline. . The image you use can tell a story and Evoke an emotion (I did this with the image in this post). Ask yourself the question, what words would your target audience type into Pinterest to find your Pin. These words are what we call ‘keywords’. Keywords tell Pinterest what your Pin is about. Pinterest has a search box at the top of their home page. When you start typing a keyword, you see some ‘suggestions’ pop up for popular keywords or related keywords. These are the keywords that we want to include in our Pinterest description. (By the way, if no ‘suggestions’ pop up, then you can assume that it’s not a popular searched term). In the example below, I started to type ‘clean eating’ and pinterest suggested these keywords, I now have a good idea on what to include in my recipe keywords by looking at these popular searches. Make a list of 4 or 5 keywords that are relevant to your pin. Where do we use Keywords? Having a keyword relevant title and description helps people find your Pin. It tells Pinterest what your Pin is about. Please don’t just cram keywords into your Pin description. Make it into a sensible, interesting sentence (I am pretty sure we used to do something like this in junior school many many years ago). Try include a call to action in your Pin description. Call to action pin descriptions can increase engagement by 80%. I really don’t like hashtags because I feel as if it looks like you’re trying too hard and takes away from the authenticity of your description. But they are now a permanent part of Pinterest search….so…. I having been dabbling with them a bit. Choose 1-2 hashtags that are popular in your niche. To find popular has tags, try typing it into the Pinterest search bar to see what comes up. Then add them to the end of your Pin description. In the example below, I started typing #cleaneating and only these two results came up. FREE FOR YOU: I have put together a one page Pin Graphic checklist for you to use every time you write a post. It will help you design a CLICK WORTHY Pin quickly and effectively. You can get your PINTEREST GRAPHIC CHECKLIST here.